It has been announced that.London's Stansted Airport is being sold to the owner of Manchester Airport for £1.5bn. Manchester Airport is owned by Manchester Airports Group, which is a holding company owned by the 10 borough councils of Greater Manchester and who run Manchester, East Midlands and Bournemouth airports. The Competition Commission are forcing the sale of Stansted and have already forced the former BAA to dispose of Gatwick and Edinburgh on the grounds that this will increase competition. 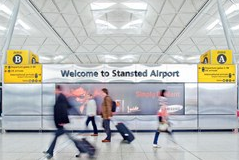 The fact that Stansted is to be sold to the company that owns Manchester Airport, East Midlands and Bournemouth, would lead us to wonder what has been achieved by selling to another large player in the UK airport game. BAA were also forced sell Edinburgh and who bought them? 'Global Infrastructure Partners' the company that bought Gatwick! As usual we are left wondering what the Competition Commission ever achieves when it gets involved in the transport sector.